So I went to the hands on Open Contrail MeetUp. It started off as a semi Q&A overview of the architecture and business use case. Contrail is a module that can be currently added to an Openstack or Cloudstack platform. I'll talk about the Openstack implementation as I know more about this Cloud platform. The Contrail Controller works entirely in the overlay. It does not know anything about the underlay except for the gateway so it expects the physical network to already be in place. This means it can interoperate with any existing switch vendor network. When you install Contrail as a Neutron plugin into Openstack, it will create a vRouter which is bound to the hypervisor. Currently KVM is the one it works with but I hear that it was tested on VMware as a vm but not directly onto ESXi. The vRouter is important because you wouldn't use Open vSwitch (OVS). The main function of Contrail is creating the overlay network within Openstack. First you would go to the Contrail Controller (Web GUI) and create the two networks. 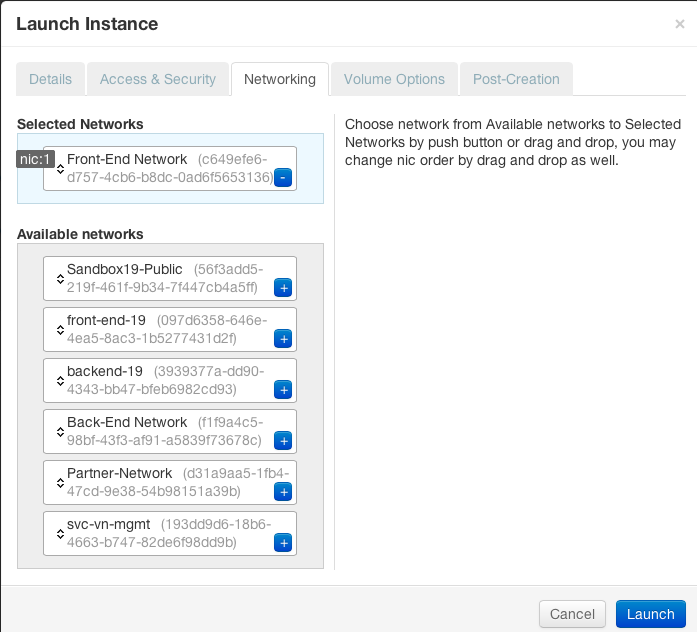 Then you would go to the Openstack Horizon Web UI and spin up your VM instances. 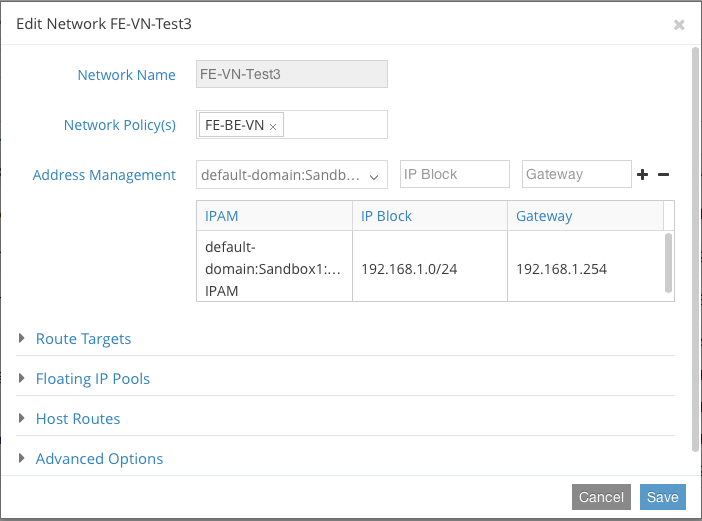 Under the networking tab you should be able to associate the network to the VM. Next you would need to create a policy so that each network can talk to each other. Think of it as creating a firewall ACL. Last you need to attach the policy to each network. Contrail will automatically assign the VM an ip address and point the default route of the VM to the vRouter. This will allow you to access the Back End Server. Overall provisioning time would be roughly 2-3 minutes depending on how fast the VMs can spin up. To understand this more you will need a Gateway router that speaks MP-BGP can can support GRE or VXLAN. A GRE tunnel will be created from the Contrail vRouter (Virtual) to the physical Gateway Router. 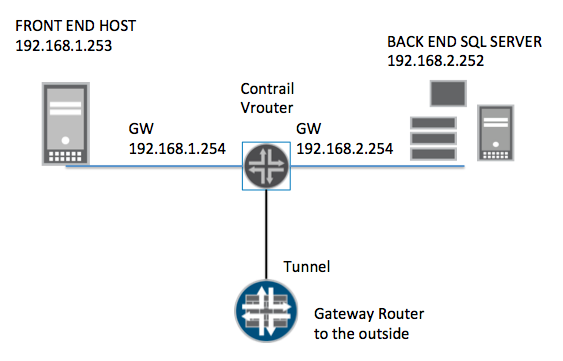 If you want to create multi-tenency, you will have to put each tunnel into a separate VRF on the Gateway Router. This provisioning is a manual process of the Gateway Router. Contrail does not manage the Gateway Router at all, however you may be able to automate this function using scripting. The vRouter will exchange routes via MP-BGP and there is a setting in Contrail to create the Router-Target. The BGP family types vRouter supports is inet-vpn (or vpnv4) and evpn. Overall the provisioning is fairly simple. There are a few things I would like "improved" in the product, such as being able to attach a policy from the networking overview "tab" instead of having to drill down into each network and doing it there. There could be a more excel feel to this view as you should be able to make modifications from this view using pulldowns or directly adding the ip subnets. Also the manual process of creating VRFs on the Gateway router is a bit tedious. I'm investigating whether Openstack has the ability run a script that can make a netconf rpc call to the gateway router. An alternative is to use slax and curl on a Juniper MX router to extract the details from the Contrail controller.